As a child, I dreamed of being a ballerina, in the sense that I admired their lovely feminine outfits and the idea of wearing such finery while an auditorium full of people gave me their undivided attention held great appeal. I was (am? Would that be a more honest word?) an attention-seeker, and the world of ballet thrillingly combined aesthetic beauty and performance for a crowd. The whole body-moving part I found less exciting. I think I did one year of ballet and tap, if whatever gyrating and flapping I and the other four-year-olds in the class did can rightly be classified as such. I do not remember the teachers, I do not remember holding my feet a certain way or raising and lowering my arms, I do not remember the practice room or the names of anyone I met, but I recall with clarity and delight the purple satin outfit I wore, shaped like a one-piece bathing suit and adorned with gold and silver sequins in a looping pattern on the front. It was the most beautiful garment I had ever seen, and I wore it around the house with a certain panache long after I'd hung up my dancing shoes for good. I wasn't interested in dance for the actual dancing, is what I'm saying. I was just an awkward, tangly-haired gal with a penchant for spangly costumes. 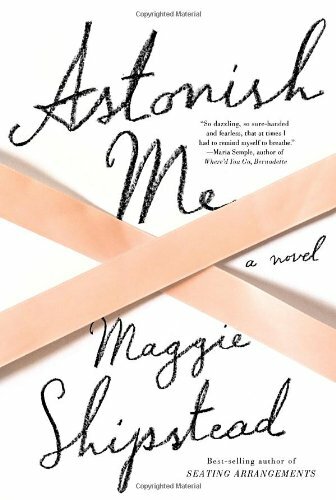 Maggie Shipstead's second novel is about dancers a little more committed than I turned out to be. It's also fabulously well-written. I was enthralled. Joan has been training nearly her whole life, with the goal of becoming a professional ballerina. She has succeeded up to a point, and as the book opens is a member of the corps in 1977 New York City. She's also newly pregnant. She knows having a baby will change everything, and that her days of dancing onstage are numbered. She settles into married life with her childhood friend Jacob and their son Harry, but Joan hasn't ever gotten over an intense affair she had with Arslan Rusakov, a famous dancer whom she helped defect from Russia. Shipstead jumps back and forth through time, chapter by chapter revealing more of Joan's history as well as Harry's emerging promise as a dancer in his own right. Not a single relationship in the novel is simple or straightforward; Shipstead has drawn each character as if with a sharp pencil, shaded with complexity and burgeoning with life. Even if you've never been to the ballet, even if you have no idea what all those French words mean, even if your idea of a barre is a place to order drinks, you will like this book anyway. The characters may be dancers, but that's not what makes them interesting. They're flawed, talented, arrogant, bewitching, jealous, graceful, insecure, recognizable people, and that's why this is a book worth reading.